Engraving by René Boyvin?, 9.9 x 52.6 S (Vienna). I. Inscribed at the lower left: Rous inv (Robert-Dumesnil). II. Inscribed as in I and at lower right: N.de Clerck ex. III. Inscribed as in II but with the second inscription scratched over, and added at lower left following the reference to Rosso: Hh ex. (Henri Hondius excudit). Robert-Dumesnil, VIII, 1850, 48, no. 76, as Boyvin, after Rosso. Le Blanc, 1854-1888/90, I, 507, 40, as Boyvin. Levron, 1941, 75, no. 189, as atelier of Boyvin. COLLECTIONS: London, 2008,7061.1 (State II). New York, 32.92.27 (21) and 49.95.169 (both II). Paris, Ed 3, in-folio (State III). Vienna, F.I.3, p.10, no. 17 (State II). Kusenberg, 1931, 162, as Boyvin, after Rosso. Linzeler, 1932, 179, as Boyvin after Rosso. 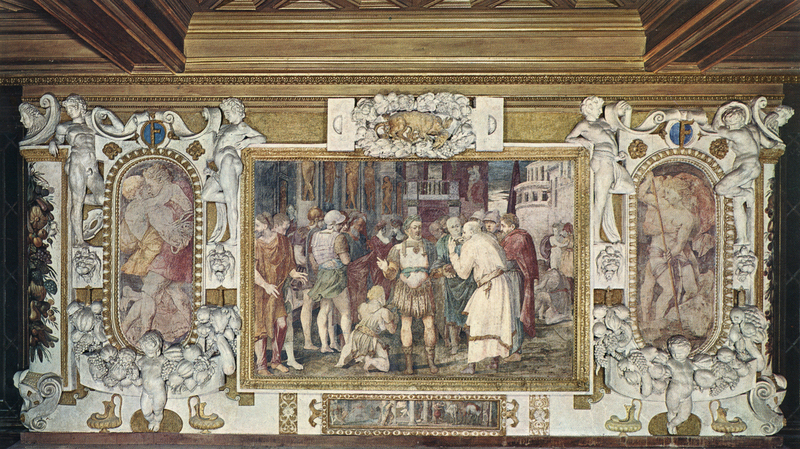 Most prints bearing Rosso’s name can be shown by comparisons with the style of other works and with documentary evidence to have been based on his designs. 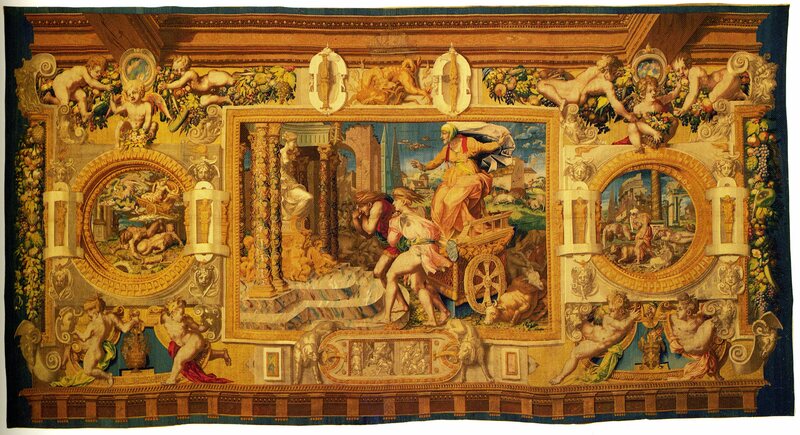 There are, however, few works certainly by Rosso with which to compare this engraving. 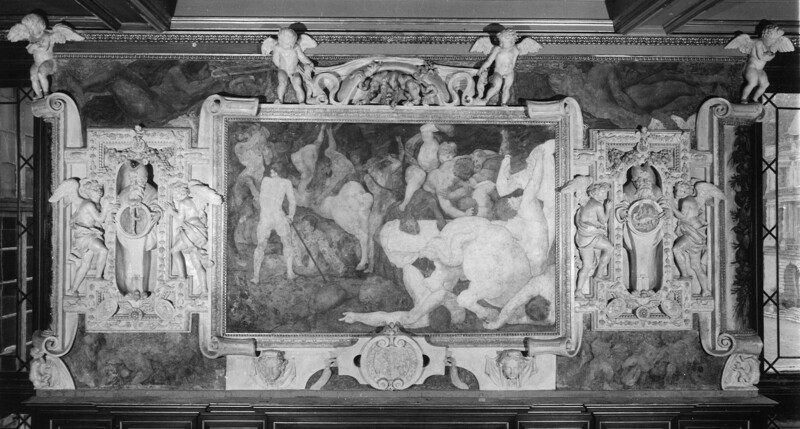 The various romping putti, painted and in stucco, in the Gallery of Francis I present the only comparisons, especially those painted below the Combat of Centaurs and Lapiths (Fig.P.22, I S a), better seen in the Vienna tapestry (Fig.P.22, I S,Tapestry, b and Fig.P.22, I S,Tapestry, c) and in the anonymous print formerly attributed to Boyvin (Fig.E.139), in stucco above the Education of Achilles (Fig.P.22, II N a), and painted beneath the stucco panels flanking the Cleobis and Biton (Fig.P.22, V S a), better seen in the Vienna tapestry (Fig.P.22, V S,Tapestry, a). 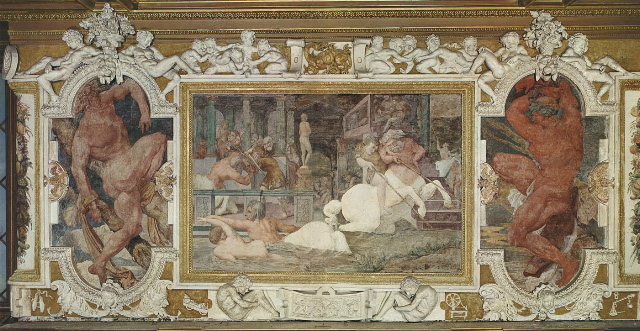 But they are more similar to the figures that appear in the tapestries than to the painted ones in the gallery, not simply because the former are better preserved, but also because, like the putti in the print, they are more varied in their anatomies and more elaborated in the details of their hair and accessories. The engraver could be responsible for these supposed elaborations. 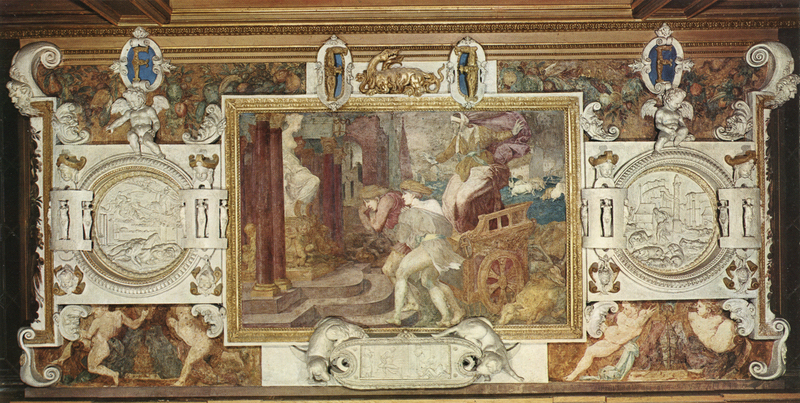 In the background, the round building, with a spiral ramp, and the obelisk are architectural types that do appear in Rosso’s works, such as the Cleobis and Biton and the Unity of the State (Fig.P.22, VI S a). 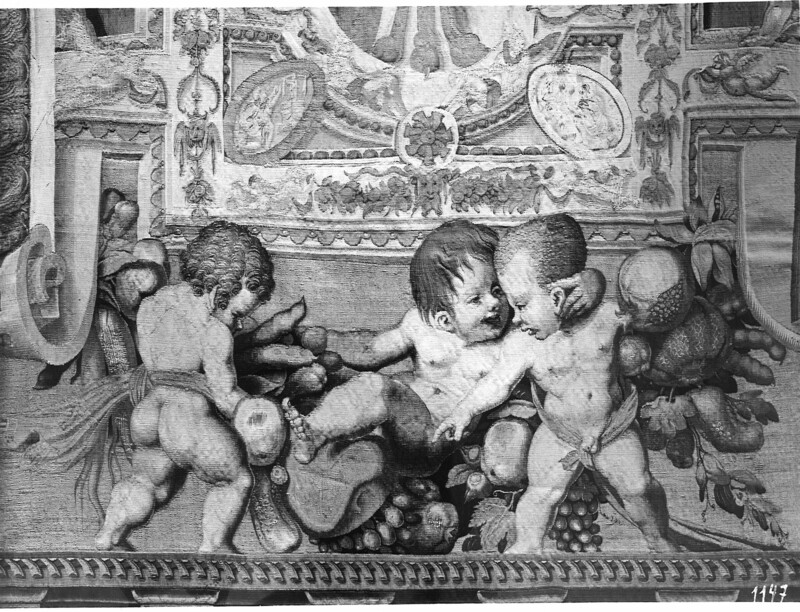 It is, therefore, possible that this composition of playing putti (made probably for a place in a decorative scheme) is by Rosso, and that it was designed in France in the second phase of his activity in the gallery, 1534-1536. But there is a smoothness in the figures and a degree of sameness about them that speak against Rosso’s authorship. Thiry’s reduction of Rosso’s art comes to mind. Neither Boyvin’s name nor monogram appears on the print and the style of the engraving does not immediately suggest him.